VANCOUVER – Following tonight’s game, the Buffalo Sabres will take a late flight back home and won’t play another game for 11 days because of the bye week and All-Star break. The time off could be a challenge, however, they will need to first play the Vancouver Canucks in Rogers Arena. Puck drop is 10 p.m. EST. The Canucks (21-21-6) are without rookie center Elias Pettersson, who has a team-high 22 goals among 42 points. They are also starting a rookie goalie who has yet to play an NHL game this season. The Sabres (24-17-6), meanwhile, will try to build off their 4-3 overtime win against Calgary. They need to bank more points before the break. Buffalo enters the game two points back of Pittsburgh for the second wild-card spot. 1. Lineup: Jeff Skinner is a game-time decision tonight, per coach Phil Housley. Skinner crashed into the boards Wednesday in Calgary, forcing him to the locker room briefly in the first period. He participated in an optional morning skate today and said he is ready to play against the Canucks. If Skinner is unable to play, Remi Elie would replace him in the lineup, and Conor Sheary could be bumped up to the top line. Housley’s lineup will stick with the same lineup if Skinner is able to play, including Lawrence Pilut on the first defensive pairing. Pilut will skate alongside Rasmus Ristolainen, leaving Nathan Beaulieu and Matt Hunwick as health scratches. The Canucks will be without Pettersson, but center Bo Horvat will play after suffering an injury Wednesday in Edmonton. They will start goalie Thatcher Demko, who was recently recalled from Utica and is one of the game’s top goaltending prospects. 2. Ullmark again: Linus Ullmark will start again after making 30 saves in the 4-3 overtime win over the Flames. The 25-year-old is 10-3-3 with a 2.86 goals against average and .917 save percentage. He has started three of the past four games and seems to have supplanted Carter Hutton as the Sabres’ starting goaltender. 3. 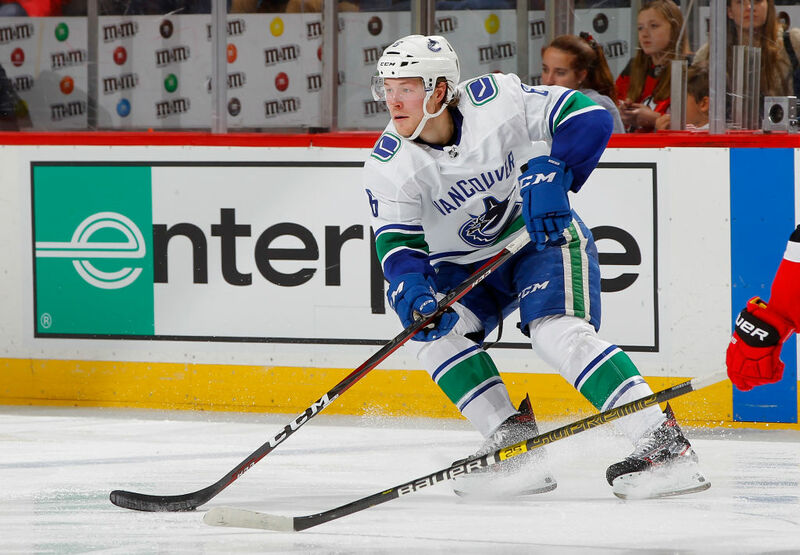 Playing without Pettersson: The Canucks play a different style of hockey without Pettersson in the lineup. That speaks to his remarkable impact and the versatility of their roster. Without a top-end talent, the Canucks will try to avoid the time of run-and-gun game the Sabres played against the Calgary Flames on Wednesday. Instead, Vancouver will try to use the same formula that led Edmonton to a 7-2 win over the Sabres on Monday. The Canucks will want to control the puck in the offensive zone, forecheck and backcheck the Sabres into mistakes, and avoid any daring passes that could lead to a Buffalo odd-man rush. It will be a simple, physical game. The Canucks aren’t lacking talent. Horvat has 17 goals among 37 points, Brock Boeser has 15 goals among 29 points, and seven other players have chipped in five games. That said, they have struggled to score, especially without Pettersson. Their 137 goals this season are tied for 17th in the NHL, and they have scored only 10 goals in four games without him, which ranks 29th out of 30 NHL teams during that span. The Sabres defeated the Canucks, 4-3, in a shootout on Nov. 10. 4. Dahlin watch: The hockey world was robbed of a Dahlin versus Pettersson matchup. They were teammates in the World Junior Championship and faced each other in the Swedish Hockey League. Though both rookies have very different personalities, they are transcendent talents and already among the best at their respective positions. All eyes will be on Dahlin tonight. With an assist or a goal, Dahlin will become the first 18-year-old defenseman in NHL history to record a six-game point streak. Only Housley, Bobby Orr and Aaron Ekblad had a five-game point streak. Dahlin leads all rookie defensemen and is tied second among all rookies with 26 points. He’s scoring at a higher rate than he did last season in Sweden. During his five-game streak, Dahlin has a plus-4 rating, and has averaged 22:10 of ice time and 3.2 shots per game. 5. By the numbers: The Sabres are 4-6 in their last 10 games against the Canucks and trail the all-time series 50-52-9. … Buffalo is 10-3-1 against the Pacific Division this season. … With a win tonight, the Sabres will have swept the Canucks in a season series for the first time since the teams resumed playing twice a season in 2013-14. Buffalo’s last two-win series against Vancouver came in 1997-98. … Sabres center Johan Larsson will play in his 300th career game tonight. … If the Sabres’ top scorers continue their current pace, the team would have three 75-point players for the first time since 1992-93 (Pat LaFontaine, Alexander Mogilny and Dale Hawerchuk).